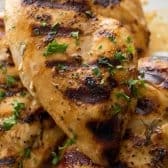 Tender marinated chicken breasts grilled to juicy perfection. Rest 3-5 minutes before slicing. Nutritional information includes 1/2 of the marinade (as the remainder is discarded).